CORVALLIS -- Since the high school girls' basketball season opened, the La Salle Prep Falcons' goal has been to win a second consecutive OSAA Class 5A state championship. That quest is down to one game. 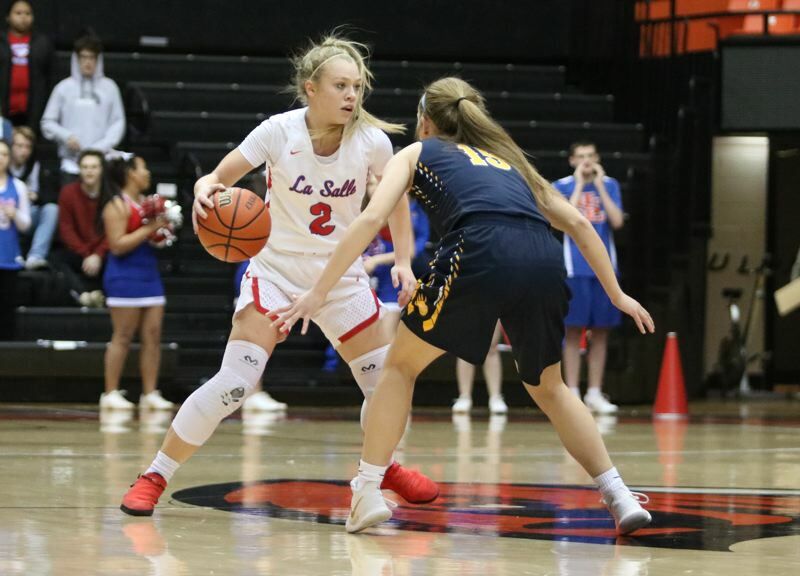 Emily Niebergall finished with a game-high 11 points to lead three La Salle Prep players in double figures as the Falcons overpowered the Bend Lava Bears 40-26 in Thursday's semifinals at Gill Coliseum. Addison Wedin and Taycee Wedin added 10 points each and Colby Jansen chipped in four points, five rebounds, three assists and five steals to help send the No. 2 Falcons into Friday's 6:45 p.m. championship final against top-ranked Marist Catholic, a 46-39 winner over Silverton in Thursday's other semifinal. "That was a slugfest and my squad just slugged it out," Falcons coach Kelli Wedin said. "Bend is tough. They have strong, athletic girls and they lock you down. "They didn't make anything easy for us and I'm just incredibly proud that we won that game." The Falcons (21-4) had a 16-11 halftime lead and then went on a 13-5 run in the first six minutes of the third quarter to break the game open. Bend (22-4) twice cut La Salle's lead to 10 points -- the second time at 33-23 on Kaycee Brown's jumper with 6:16 to play -- but lacked the outside shooting to mount a serious comeback once they fell behind by double digits. "The second half, we were solid," Kelli Wedin said. "We were not letting Bend back in. Our girls have been saying lately that they 'refuse to lose.' They understand what's at stake and they understand that every, single possession is important on this stage and you have to make plays and you can't take plays off. "The girls have just continued to prove themselves all year." After La Salle defeated Silverton in last year's championship final, the Falcons went through several significant changes. They graduated four seniors, including three-time 5A Player of the Year Aleah Goodman, two starters transferred out, and Taycee Wedin and Addison Wedin both underwent surgery to repair torn ACLs, raising serious doubts about where the program stood heading into the 2017-18 season. "I think people thought, 'Hey, La Salle can't do it again, not with all those circumstances surrounding that program,'" Kelli Wedin said. "But we worked. Those kids sacrificed a lot and are completely dedicated to this basketball program and that's why they're able to defend their state title." This marks the third time in four seasons since La Salle made the jump from 4A that the Falcons have played in the 5A final, having won state titles in 2015 and 2017. "It just means everything with this team," Kelli Wedin said. "I think they wanted to prove some people wrong and show them that, 'Hey, we're still La Salle basketball and we're still competitive every, single night.' We don't care who we play. "We work hard and we compete every possession and it's special this year. It's really, really special because, honestly, in the first week of basketball, I guarantee nobody thought we were going to be in this position with the adversity that we faced." La Salle's players never stopped believing that they would be one of the final two teams standing on Saturday. "We've been hoping for this moment," Taycee Wedin said. "We've been putting in work every, single day, so … yeah, I mean, we expected to be in this position. "We're at this point where we refuse to lose and we're taking it to every team as hard as we can." La Salle defeated Marist Catholic 65-56 in the Dec. 8 season opener in Eugene, so the Falcons have a good idea what they'll be going up against the final. "It's going to take a lot of toughness and grit," Kelli Wedin said. "Marist has a lot of firepower, they have a lot of depth, and they're well-balanced. "At this point in the season -- the state championship game -- it's really about heart, it's really about hustle and just having resiliency and fighting through adversity and sticking together. That toughness and that grit right now, that's everything tomorrow. "We're one of Marist's very few losses and that was early -- the first game of the year. How ironic that we're playing them again, No. 1 versus No. 2. They're a good team and a scary team, but I love my squad and I know we'll fight and I know they'll compete. I'm excited for it, and I know they are too."